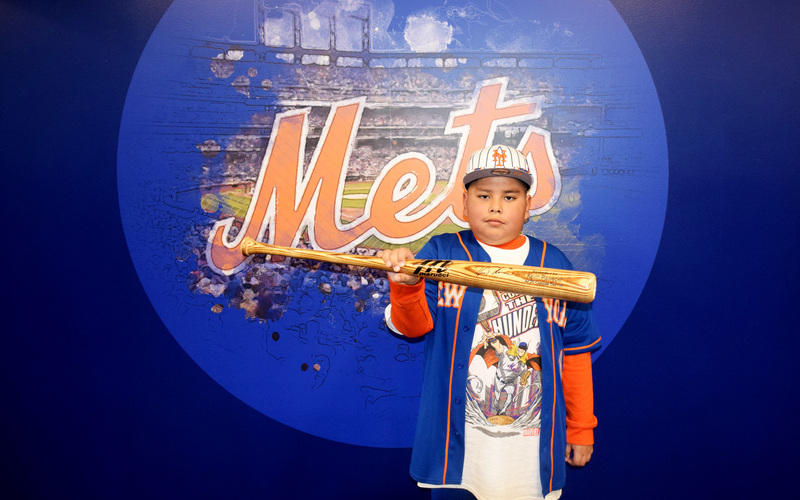 Rocky, a Blythedale patient, holds a bat given to him by NY Mets catcher Kevin Plawecki during a special clubhouse visit at Citifield before seeing his favorite baseball team play. Walking into a major league ballpark is often an impressive sight to see, but for one Blythedale Children’s Hospital patient and his family, attending a recent baseball game held even more meaning. Nine-year-old Rocky, a previously healthy and active child, suffered a stroke in July. He was rushed to the hospital where he was diagnosed with a brain hemorrhage from the unexpected rupture of an AVM, or arteriovenous malformation - a rare congenital condition. The all-star athlete, who participated in baseball, football and wrestling, had lost the ability to move the left side of his body, walk and speak. Rocky would need brain surgery to remove the AVM, but only after the swelling in his skull subsided. Until then, Rocky’s medical team recommended Blythedale Children’s Hospital as a way for the Bedford Hills boy to prepare for upcoming surgery. When medically stable enough for transfer, the fourth-grader was admitted as an inpatient to Blythedale’s Traumatic Brain Injury Unit. Rocky received extraordinary multidisciplinary treatment by board-certified physicians, experienced nurses and pediatric-trained physical, occupational and speech therapists to help strengthen his body and mind. Plus, his hometown also came out in full support, holding various fundraisers to help Rocky’s family. In August, Rocky underwent brain surgery to remove the AVM. He was soon able to return home to his family, friends and community because of a shortened recovery time, made possible in part, by the treatments and therapies provided at Blythedale. With the new school year, Rocky was admitted to Blythedale’s Day Hospital - a unique program for children who live at home, but still require a level of medical and/or rehabilitative care that can’t be met in their home district. He was also able to resume his education at Mt. Pleasant Blythedale School, the only onsite public school district in New York State on the grounds of a hospital. Rocky picked up, right where he left off, with various therapies to help increase strength and endurance to his extremities, relearn how to walk and navigate terrain throughout his school day, while also working to improve cognitive deficits and his ability to perform tasks of daily living. Rocky’s story touched the hearts of many, including his favorite baseball team - The New York Mets. After hearing about Rocky and his enduring spirit, the team invited the young boy and his family to a special game in late September. It was one they will never forget.